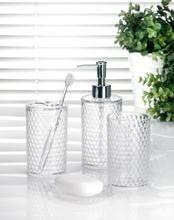 Taiwan Diamond Solid Bathroom Set Metallic decal on sides | AZUDA INTERNATIONAL LTD.
MS bathroom accessories include lotion dispenser, toothbrush holder, tumbler and soap dish. Diamond embossed design in opaque solid color with multi-surface gives you sparkling refraction. Glassy transparent appearance can enhence wide variety of bathroom decorations. 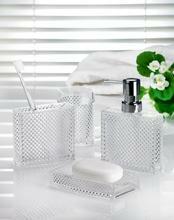 With diamond bathroom accessories, you will sure have delicate visual enjoyment. Glassy Dream of Pink Ba..